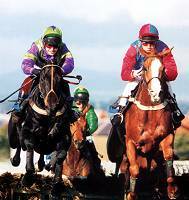 Among the many highlights are the Christmas and Easter National Hunt fixtures, the prestigious two day June flat meeting at which the historic Carlisle Bell and Cumberland Plate are run, and the popular summer racenights. Excellent road, rail and air links make this picturesque track easily accessible from all parts of the country. Carlisle Racecourse is the ideal place to entertain business associates, customers, staff of friends and family in a unique relaxed atmosphere. Few other sporting events can match the excitement, glamour and colourful spectacle of a day at the races. The Racecourse is 1½ miles South East of the city centre. By Road: Two miles from junction 42 of the M6 motorway. By Rail:It is just five minutes from Carlisle railway station which is on the Virgin West Coast inter-city line connecting with Glasgow Central in the North and London Euston in the South. By Air: Carlisle Airport is eight miles from the course.